The “AD” in AD Systems Integrators stands for Alarm Design, our parent company formed in 1993 for the purpose of installing residential and commercial fire and burglar alarm systems. Over the years, while keeping pace with emerging trends in the custom installation industry, we have sought out the best product available in each of the categories that we offer. We have grown significantly over time due to high customer satisfaction and the resulting word-of-mouth recommendations. We are a true local, homegrown Southampton company built on solid customer relations and our goal of providing unrivaled service and uncompromising quality. We now offer an even broader range of services, including home automation, telephone systems, surveillance and security systems, detectors for fire, smoke and flood detection, custom home theater solutions, landscape lighting, gate automation, cell signal boosters and more. AD Systems is very proactive in employee training and certification. We stand behind all of the products and services that we offer and service is available 24/7. We are very proud of our ongoing relationships with past clients and we are happy to provide references upon request. When we are not conducting alarm and custom integration business, we’re still doing important work. Owner Patrick Lenahan is also a beekeeper who works to keep a bee’s life in the Hamptons one of good health and beautiful shoreline adventures. Lucky clients favor the Amagansett Raw, Amagansett Buckwheat, Southampton Raw and Springs Raw varieties. The hue of each batch reflects the flowers visited by our trusty bees and they range from a light golden shade to a deep, lustrous dark brown. 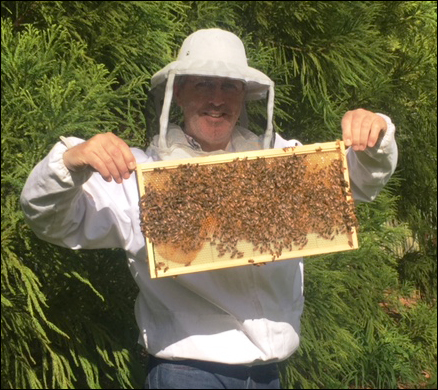 Patrick Lenahan, Owner, also serves as top beekeeper and honey collector, working to keep bees well-fed and healthy in every way. We love bees!